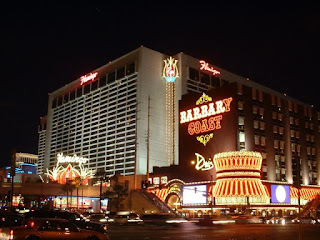 Bill's Gambling Hall - formerly The Barbary Coast which was almost an iconic Las Vegas Strip property as it occupied one of the most prominent places on the strip at a major intersection. If money *is* an object to you during your Las Vegas trip, you'll want to consider rooms at places like Bills, Imperial Palace, Sahara, Circus Circus, Stratosphere, Flamingo, Harrah's and others in the moderate price category where you'll have a large nice room for anywhere from $50 to $100. Many people like to splurge in Las Vegas since the world class accomodations here are not too expensive. For example rooms at the Bellagio, Wynn, or Palazzo are only about 200 per night and sometimes less with specials or mid-week. Always ask about special deals and do a little research before you book. Rooms during some conferences or over the weekend can cost *hundreds* more than the same room mid-week when many hotels have vacancies.